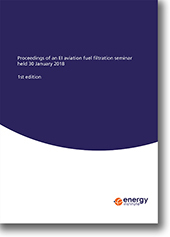 Prepared by the Energy Institute’s Aviation Committee, this publication collates material that was presented at an EI seminar on aviation fuel filtration, with a focus on filtration used for aircraft refuelling. The intention of these proceedings is to disseminate the material to all interested stakeholders, thereby raising the level of awareness of the need to transition away from the use of filter monitor technology and inform the industry of the potential alternatives. The information contained in this publication will be of significant interest to airlines, into-plane fuelling companies, aviation fuel suppliers, hydrant/airport depot operators, original equipment manufacturers and any other organisation involved in aviation fuel cleanliness.